how is a w column connect to concrete footing? 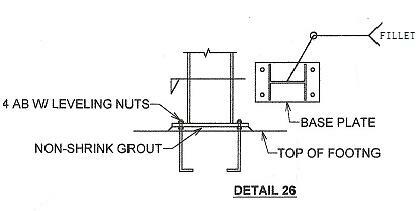 Wide flange column, w or I column all refer to the same column shown on detail 26 below. Columns are connected to the concrete footings with anchor bolts or AB as shown on the detail. These anchor bolts do not have to be J bolts that were placed at the time the concrete footings were poured. For steel erection, leveling nuts are required to hold the bottom of the baseplate at the designed elevation while the top nut is being tightened. The gap between the bottom of the baseplate and top of footing will be filled with non-shrink grout after the erection is completed. Once the leveling nuts are at the designed elevation, you can lower the column in place and tighten the top nut. It is very common that the anchor bolts are installed at wrong location or wrong orientation. For example if the anchor bolts were installed 2 or 3 inches off the intended location or the concrete contractor mistakenly rotated the anchor bolts 90 degrees(see det 26 AB plan view), the column will land at location with no anchor bolt or the baseplate holes will not lineup with the installed AB. The fix for such mistake depends on the engineer recommendation. For residential construction where engineer involvement is almost non-existent, it is not that big of a deal, just get 4 expansion or epoxy bolts, drill new locations, install bolts per manufacture's recommendations and you are back in business. However, in commercial construction fixing this type of mistake can be very tricky because the special inspector will definitely write up a non-compliance report (NCR) regarding this deviation from construction plans. This NCR will end up at the city building department as part of the punch list at the close out of the project ready for occupancy. If you are a concrete contractor or steel erector you need to make sure these types of non-compliance are addressed timely. You don't want to be the responsible sub that will be back charged for breaking out the finished floor tiles or carpet to chip the concrete in order to get to the AB fix.